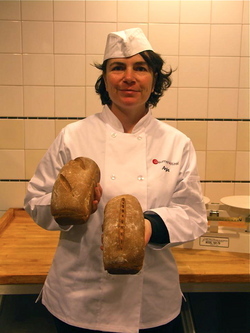 Anja Voth with graham bread. I was curious about an ad I saw on Craigslist about a North German restaurant and bakery coming to North Berkeley called ~GAUMENKITZEL~. The owners are Anja Voth and her husband, Kai Flache, who are committed to a very seasonal, housemade, and whole ingredient approach (along with sustainable, local, organic, and fair trade, natch). They will be serving a traditional and authentic German breakfast (6am-11am and until 12pm on Sundays), lunch (11am-2pm and until 3pm on Sundays), “kaffee and kuchen” in the late afternoon (2pm-4:30pm), and an evening menu (4:30pm-6:30pm)—they plan to extend hours later into the evening in time. The menu will feature many house-baked goods, like frühstück, their homemade bread paired with a variety of toppings for breakfast (ranging from housemade jam to eggs to cold cuts), plus muesli, granola, and brötchen (open-face breakfast sandwiches). Lunch will bring delicious-sounding soups (cream of broccoli with sunflower seeds), salads, and heartier dishes like fricassee of chicken with asparagus and capers in a white sauce, served with jasmine rice. SFoodie also mentions this: “Since the couple is from Hamburg, fish will be a big presence on the menu (Monterey Fish has been tagged as the house supplier, says Voth).” German supper includes cold cuts like housemade roast beef or liverwurst with three slices of bread and butter, or oven-roasted vegetables and herbed quark, or you can choose from the lunch menu. Speaking of quark, Anja mentioned they’ll be using the smooth, fresh cheese in a variety of items, baking with it in the breads, desserts, and more. There will be beer and wine, and they are also talking about using Ecco Caffe for their coffee.